Go Wild in the Garden: it’s a real buzz! Participants in Go Wild in the Garden get to make their own Pollinator Inns. Photo by Murray Arts. The Murray Science Hub is ushering in Spring with a hands on approach to environmental education with Go Wild in the Garden, a fun and informative way for the whole family to learn about pollination and its vital role in the natural world. 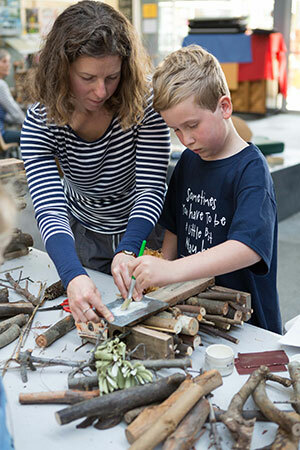 Participants get to make their very own Pollinator Inn with acclaimed sculptor Joanne Diver sharing information on how community members can help encourage our native pollinators to get wild in their own gardens. Go Wild in the Garden kicked off at the Albury Botanical Garden earlier this month with Dr Manu Saunders introducing the various types of insect pollinators you might find in your own gardens. Then Karen Retra talked about the bi-annual Wild Pollinator Count, a citizen science initiative that gives everyone an opportunity to contribute to a national conservation about wild pollinator insects in Australia. All are encouraged to help count wild pollinators in their local environments and add this information to build a database on wild pollinator activity. Find out how to get involved. The main insects hovering about at the launch event in Albury were hoverflies (which are bee mimics) and the European honey bee. A dozen new insect fans learnt the ins and outs of building a bee hotel with artist and self- confessed ‘backyard garden enthusiast’ Joanne Diver. Everyone enjoyed the event and had fun making their Pollinator inns. Vivien Naimo works at Murray Arts and is the convener of the Murray Science Hub. Go Wild in the Garden is a partnership between Murray Arts, Halve Waste (Reduce Reuse Recycle) and the Wild Pollinator Count with support from Inspiring Australia (NSW), the Sustainable Activity Centre (SAC), local community gardens, Albury Botanic Garden and the Stephanie Alexander Garden in Corryong.